We planned to go down to Class95's 'Movies In The Park' on Saturday. 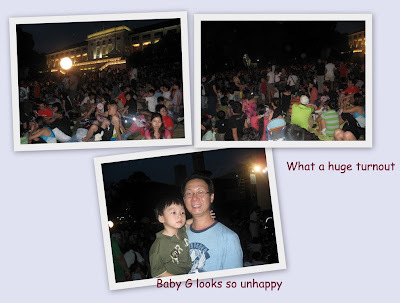 However, we went down quite late and also, Baby G didn't like the loud music coming from the speakers.. so in the end, we just stayed for a while and left without catching the movie. I was quite disappointed, but well, there's always a next time. Since Baby G didn't like the 'Movies In The Park', we drove down to Central to have our dinner. 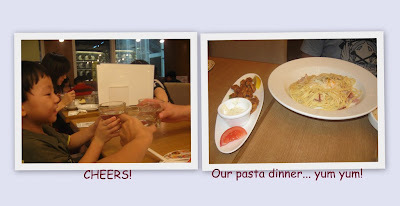 We decided on Pasta de Waraku and chanced upon a 1-for-1 deal. Cool! 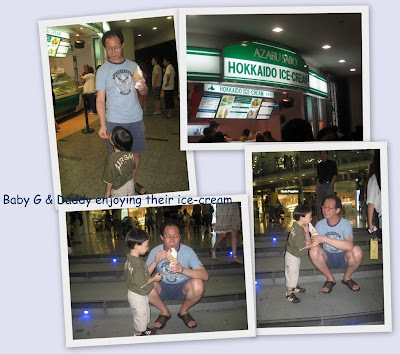 After our hearty meal, we passed by the Hokkaido ice cream just outside of Central. Without hesitation, we order 2 scoops for the 3 of us. Needless to say, Baby G simply loved the ice cream.